Ever since Nick Fury snuck into Tony Stark’s mansion in Iron Man, post-credits and the occasional mid-credits scenes have become a popular way for superhero movies to tease what’s coming for the future of their franchise. This is how Marvel introduced important folks like Thanos, Scarlet Witch, Quicksilver and Howard the Duck (okay, that last one may not be so "important"). Even Fox has started using them more for their X-Men movies, although don't forget, they did have one in X-Men: The Last Stand two years before Iron Man. However, DC has typically eschewed these extra scenes, but many wondered if Batman v Superman: Dawn of Justice might break the trend given how focused it was on laying groundwork for the rest of the DCEU. Alas, as many discovered after sitting in the theater for that extra 10-15 minutes, it was not to be, but honestly, that was for the best given the content within the movie itself. Let’s go over again what the primary goal of a superhero movie’s end credits seen is: to tease what’s coming. Obviously there are some exceptions, but usually these creative minds want to give audiences a hint of what they can expect in a future movie. To use an example from two studios, it’s how Marvel told audiences that Thanos was the MCU’s big bad in 2012’s The Avengers and it’s how Fox showed that Apocalypse was coming in 2014’s X-Men: Days of Future Past. The closest DC has ever done to this is when Sinestro put on the yellow ring in 2011’s Green Lantern after some of the credits rolled, and that didn’t even pay off in a sequel due to the movie’s poor reception. Of course, times change, and even though Man of Steel didn’t have something after the credits, there’s no reason Batman v Superman: Dawn of Justice couldn’t have included something. Here’s the thing: they didn’t need to include one because they already teased what’s coming in the main story many times. In the midst of the Caped Crusader and Man of Steel’s much-hyped conflict, there was plenty of hinting towards other areas of the DC Extended Universe. The Robin costume displayed in the Batcave. Batman’s "Knightmares" that showed a world corrupted by Darkseid. A future Flash delivering a warning to Bruce Wayne. Lex Luthor’s encrypted files on Wonder Woman, Aquaman, Flash and Cyborg (all of whom inexplicably had their own symbols already). Lex babbling in prison about a mysterious individual coming to Earth who is probably Darkseid. There was even that deleted scene of Lex conversing with a being possibly from Apokolips within the Kryptonian ship. This movie planted seeds not just for Justice League: Part One, but a decent amount of the DCEU movies coming between now and 2020. 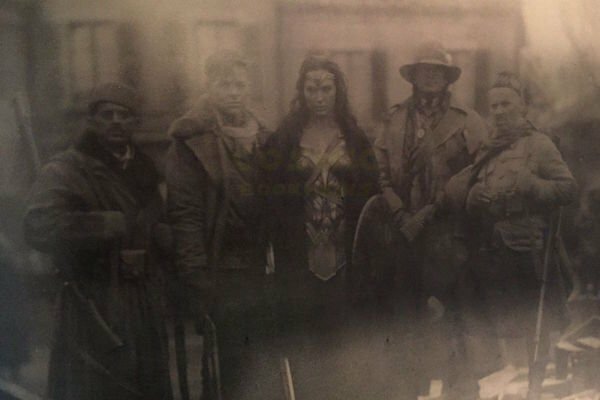 Whether including these moments was always part of the plan or a way for DC to "catch up to Marvel," Batman v Superman: Dawn of Justice did its job by showing audiences what’s in store for their cinematic universe, like with the Wonder Woman World War I photo below. Including a post-credits scene would have been overkill. Beyond that, there’s another reason why it was good Batman v Superman: Dawn of Justice didn’t include a post-credits scene: time. The theatrical cut of the movie is 151 minutes, i.e. over two and a half hours. At that point, with that length and all the DCEU teases sprinkled throughout the main story, you can bet many folks wanted to get out of their respective theaters and work the feeling back into their legs. Now, this may seem hypocritical given that Captain America: Civil War will be 146 minutes, a.k.a. the longest Marvel movie to date, and you can guarantee it will have a post-credits scene and maybe even a mid-credits one as well. However, this far in the game, Marvel won’t just stop tagging these extra scenes to their movies, regardless of length. Whether that’s setting up Doctor Strange in November of teasing the Mad Titan arriving in Avengers: Infinity War Part I, they won’t leave fans hanging. Batman v Superman: Dawn of Justice already did that for Justice League: Part One and then some, so if folks didn’t want to sit through those credits, they didn’t have to. Rest assured, Batman v Superman: Dawn of Justice had more than enough "post-credit" material within the movie itself that having a few extra minutes once the credits finished rolling wouldn’t have spiced things up anymore. Just because Marvel movies like to use them doesn’t mean they need to be the norm for all superhero movies. In fact, don’t be surprised if Suicide Squad, Wonder Woman and the other future releases don’t have any of their own. Warner Bros and DC may have already decided this is one feature they don’t want to tag onto their big screen releases. As for Batman v Superman: Dawn of Justice, if the teases in the theatrical cut weren’t enough for you, you’ll undoubtedly get many more in the R-rated "Ultimate Edition" home release this July. What do you think? Should Batman v Superman: Dawn of Justice have included a post/mid-credits scene, or were we better off without one? Let us know in the poll and the comments below! Should Batman V Superman Have Had An End Credits Scene?